Home Recipe Hearty How About Some Vegan Chile Rellenos? 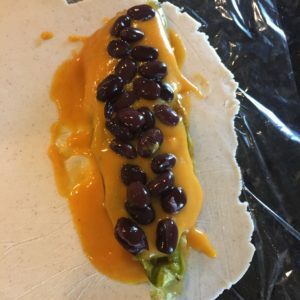 Roasted peppers snugged in tangy vegan cheese sauce with some black beans and wrapped tight in a fresh-made tortilla. Hot, savory, yum. Chopped tomatoes on top are a cool complement. Basket of fresh-picked Anaheim peppers in hand, my sweetie was eager for the deep, hot flavor of roasted chiles today. “Got any recipes?” he asked. I didn’t, but Chuck Underwood at Brand New Vegan did. “More of an idea than a recipe,” his website reads. Spoiler alert: Tonight’s dinner was a relatively easy do, and almost as fun to make as eat. Making corn tortillas and roasting peppers fills the kitchen with luscious savoriness. 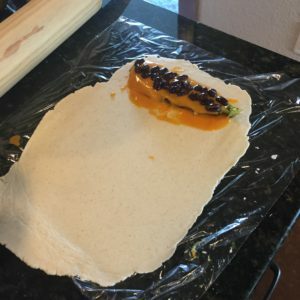 Here’s what we did, following Chuck’s idea but roasting our own peppers and making our own tortillas (simple to make and tastier than purchased variety). 1.We roasted about a dozen Anaheim peppers, several were pretty small. Laid them out on a cookie sheet covered with parchment paper, 400 F, 10 minutes on one side, then 10 minutes on the other. The scent of roasting peppers is … lovely. 3. Erin whipped up some corn tortilla dough. As per the package, 2 cups masa harina to 2 cups water. 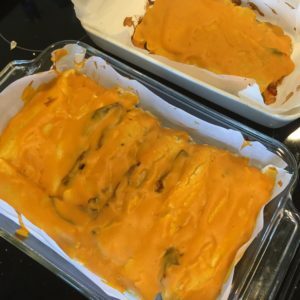 Instead of making round tortillas on the press, Erin rolled out rectangular tortillas.On each tortilla, we spread a little tangy cheese sauce, laid down a roasted pepper, spread it with more cheese sauce and a few black beans. (In the future, I might add a little corn, or chopped red pepper, or ooh, roasted onions.) Then Erin rolled the tortilla over the pepper until the dough met up, pressed the edges together, pinched it off and laid it on a parchment paper lined casserole. 4. 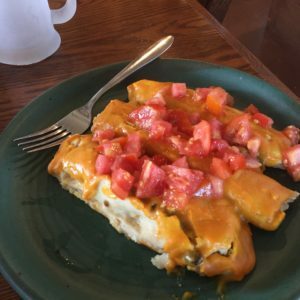 We filled a small casserole with these naked (uncooked) tortilla-wrapped enchiladas and in another tinier casserole, made a quesadilla-like pie of the smaller peppers. 5. Into the oven these dishes went, baking at 400 F for 20 minutes. At 15 minutes, we took them out and smeared on more vegan cheese sauce, shoving them back in for a final 5 minutes of heating and melding. When they’re done, it’s time to eat. Oh, they were good. A definite do-again, a definite let’s plant more peppers in the garden and make this more often. Next time we’re going to cook these on a paper-lined cookie sheet, giving each relleno getting some elbow room from the other to boost the overall tortilla crispiness, but that’s a fine-tuning move. P.S. This dish is fairly hot, spicy pepper wise. Enjoy! 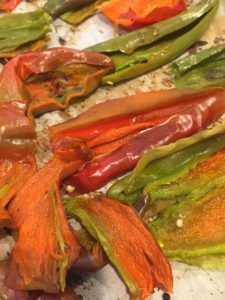 Roasting peppers deepens their flavor, making it a bit more complex. Here we’ve cut off the tops and removed the seeds. 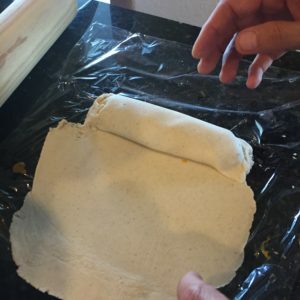 We rolled out rectangular, not round tortillas. Each wrapped two peppers. A smear of vegan cheese, pepper, more cheese, some beans. Erin used plastic wrap to help bring the uncooked tortilla around the roasted pepper and filling, then pinched it off to start another. Fresh out of the oven, these chile rellenos smell delicious! Brand New Vegan, carrots, cheese, chiles, Chuck Underwood, corn tortillas, potatoes, recipe, tomato. Bookmark.